From our collection of Art Deco style garden and outdoor lights. The Bern Art Deco style outdoor wall lantern. 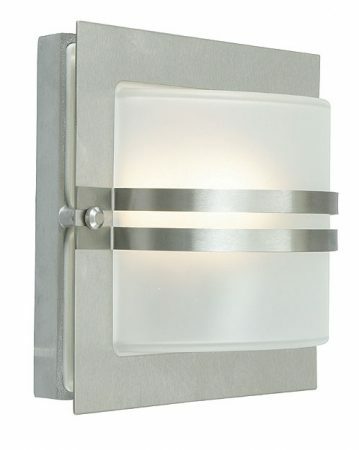 Square shaped wall mount with central section creating a soft glow surrounding the wall light. Square shaped stainless steel front section with two bars curving around the opaque lens. A perfect choice for the Art Deco themed home. A quality outdoor lighting product made to last. Clear glass option also available on request. Elstead lighting are the sole distributor for Norlys a Norwegian, the manufacturer of these top quality outdoor garden lighting range. All Norlys outdoor lights are made to an extremely high quality, made to withstand extreme climate conditions and come with a 25 year anti corrosion warranty on all aluminium parts and 15 year warranty on all galvanised and painted steel.